This retelling of The Mahabharata from the perspective of one of the female characters is simply one of the most beautifully-written books I’ve ever come across. Its transcendent ending actually brought tears to the eyes, something a book seldom does for me. I cheat a little here by including all four volumes of Campbell’s magnum opus. While I may now resist some of his conclusions and his somewhat schematized approach, Campbell had the sort of comprehensive knowledge of history, mythology, and religion that I would love to be able to emulate. This radically intelligent Canadian novelist has remained something of a cult favorite. If you’ve never read anything by him, this would be a good place to start. You’ll end up reading more, I’m certain. Rarely has a novel taken the reader inside someone’s mind and experiences so vividly. Even now I can practically feel the griminess of Raskolnikov’s clothing. I can’t really add anything to what so many others have said about this masterpiece. “Many years later, as he faced the firing squad, Colonel Aureliano Buendía was to remember that distant afternoon when his father took him to discover ice.” How can one read a first sentence like that and not want to read on? This opinionated history of twentieth century art (the companion book to a television series I’ve never seen) came to me at just the right time. It remains the only book in my life that so gave me the information that I craved that when I finished it, I went right back to the beginning and read it a second time. A crazy, atmospheric novel that portrays the “logic” of dream better than any other I’ve come across. It captures the innocence, self-centeredness, pretentiousness, and growing awareness of an intelligent young person amazingly. An imaginative journey like few others. The first novel I ever read by my current favorite novelist. I can’t wait for the English translation of Colorless Tsukuru Tazaki and His Years of Pilgrimage coming out in a few months. By the way, Happy 65th Birthday, Mr. Murakami! Time: 6:30 Sunday morning, with the sun just making itself known. Place: At my main computer, still surrounded by the same mess of computers and books I wrote about in my last Salon a few weeks ago! Cleaning needs to be a major priority for me. Consuming: Nothing, although I have a strange craving for hot chocolate. Reading, Watching, Listening: A few days ago the Nevada Chamber Music Festival came to an end. With twelve concerts in six days, the Festival had me putting in over seventy hours of work (and by no means was I the hardest-working person associated with the Festival). With a schedule like that, it shouldn’t be surprising that little in the way of reading, or anything else for that matter other than fitting in some occasional sleeping, went on during those six days. That the Festival was a great success, artistically and financially and in terms of audience appreciation, is very gratifying. But honestly, I didn’t hear much of the music, and didn’t get much out of the experience other than the exhaustion that is still plaguing me. Right before the Festival I finished reading Roger Lipsey’s The Spiritual in Twentieth-Century Art, and now that I have some free time I may write about it (but possibly not; see below). I have moved on to The Circle by Dave Eggers, and will soon be embarking on both Michael Coe’s Angkor and the Khmer Civilization and Noble Ross Reat’s Buddhism: A History. Pondering: Whether or not to continue this blog. For the three-and-a-half years this blog has been around, I have entered in it, very sporadically, my thoughts on the things that interest me, a very peculiar mix of books, music, films, art, and anything else that happened to grab my attention at the time. It was begun, and has continued, because I have all too little actual conversation on any of these subjects in my real life. In olden times I had friends with whom I would sit for hours, very often drinking, and discussing philosophy and listening to music and arguing politics and such. A couple of those valued friends are now deceased, and the others have moved on geographically or psychologically. In recent years it has become apparent that if I’m going to go to a concert or museum or film or play, it’s going to be alone. But I still feel a desire to share my thoughts and enthusiasms. The blog has become my interlocutor, even though it is the nature of blogging that the conversation is largely one-way. Fortunately for you, kind reader, your participation is entirely voluntary! However, knowing that this blog reaches but a few dozen people on its very best day, is there actually a need for these writings, aside from within my own consciousness? I don’t yet have an answer to this question, but am continuing to ponder it. Blogging: My last blog entry was a review of the most-read blog posts here ever. It was fascinating to see what subjects have attracted the attention of readers. Anticipating: My trip to southeast Asia is less than two months away now. It still feels very distant, but in a few weeks I’m sure it will start to become real to me. 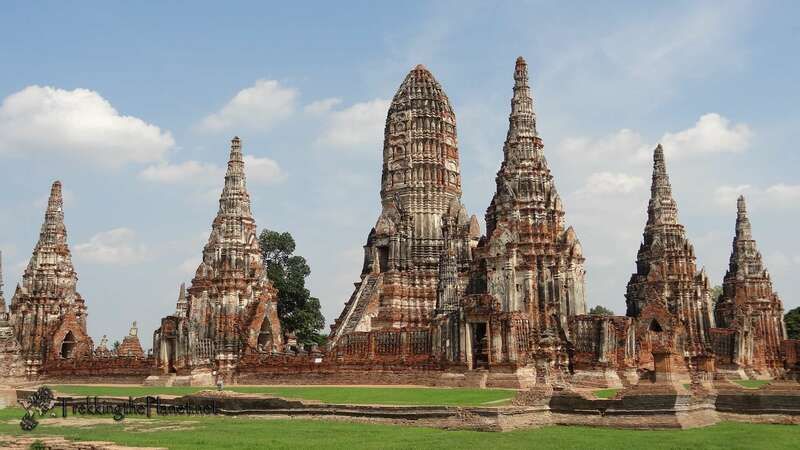 Gratuitous Temple of the Week: Wat Chaiwatthanaram, Ayutthaya, Thailand (one of the places I’ll be visiting during my upcoming trip). Photo from Trekking the Planet.